While the population of 4G smartphones continues to flourish, the hierarchal order of devices becomes more defined. Take the Samsung Exhibit 4G, for example. 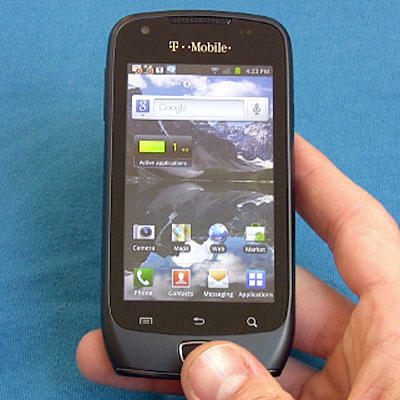 The pint-sized Android 2.3 Gingerbread machine is a mere $80 after a $50 mail-in rebate with a two-year T-Mobile voice and data plan. This is T-Mobile's cheapest 4G smartphone to date, let alone the cheapest 4G phone in existence at this nanosecond in time and space. I saw the Samsung Exhibit 4G as more of a supercharged feature phone, rocking HSPA+ speeds, a bright AMOLED screen, and full Flash support for web browsing. The Samsung Exhibit 4G was a refreshing sign that not all 4G phones have to have big, bad attitudes. This was a simple texting, calling, and Internetting device that inherited many key features from its neighboring giants. Let's take a look at the Samsung Exhibit 4G in our full video review. In the end, the Samsung Exhibit 4G exhibited a solid performance overall. Its speed, courtesy of the 1GHz Hummingbird processor, was hasty enough to pull me through the day, even though it lacked the supersonic punch of a dual-core. I was a fan of the Exhibit 4G's bright AMOLED screen, and the fact that the phone shipped with Android 2.3 was a pleasant surprise. The Exhibit 4G's portable iPhone-like size and unconventional design were plusses in my book, and its stellar battery life made me a believer in the potential of smartphone longevity. On the other hand, the Samsung Exhibit 4G's 3-megapixel camera produced lackluster images and WVGA videos, and its 9GB of memory out of the box might be limiting for the multimedia-hungry user. But as a calling, messaging, Internetting device, the Samsung Exhibit 4G is a pint-sized gem for $80, especially when you compare it to 3G feature phones that run for the same price and do a lot less. If anything, the Samsung Exhibit 4G is the first toadstool to shoot up in the "Budget 4G" forest, and Samsung is credited for inciting the bumper crop to come.